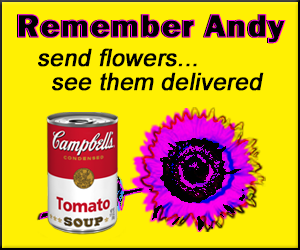 Andy by sending a Campbell's soup can or flowers to his grave. Watch this news clip to learn more about this unique webcam project and to hear what the media has to say. Background image: William John Kennedy, Homage to Warhol's Flowers, The Warhol: Museum Edition (detail), executed 1964, ©2012 William John Kennedy, courtesy of Kiwiartsgroup.com. For more information about The Warhol: Museum Edition portfolio, visit www.warhol.org/editions.